In the past I have ridden a couple of Schwalbe Ultremo ZX tyre on my my road bike. I had a very good experience using them. This is an updated review which originally appeared on my old blog. 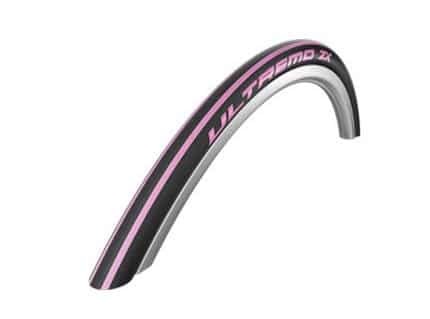 The Ultremo ZX is a slick racing tyre – light, fast, very easy to put on and looks good. Perhaps I had good luck, but I got through 3,000-4,000km without a rear tyre puncture – which is quite unusual for a light racing tyre. But, don’t sue me if you get a few during that distance. I’ve seen them on sale for as low as £20.99 – at that price it is really very good value for an upcoming summer tyre. The Ultremoz ZX V-Guard has a weight of only 195 grams [same weight as previous Schwalbe ZX version] It also has a low rolling resistance. Grip in the dry is very good. As you expect from any tyre, it performs less well in the wet; so there is a need to be relatively cautious on wet descents. However, I’ve had no major problem with lack of grip. I was using a 23″ tyre. A 25″ might be my preferred choice now. 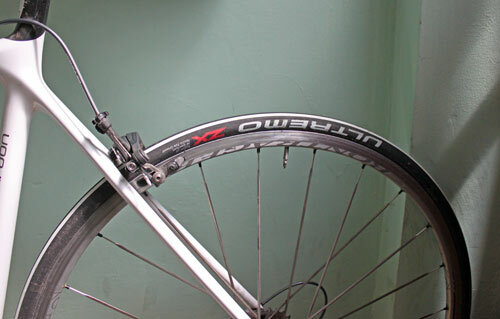 I’ve used the tyre on hilly rides across the Lake District, Yorkshire Dales and Oxfordshire. It performed well on the ascents and descents of Wrynose pass / Hardknott pass – despite roads being wet. Also, these roads were very gritty, rocky and hard work. The tyre was resistant to cuts against these rough road surfaces. I’ve never had a road tyre which fits on so easily. Very easy to work with. The rubber feels quite smooth and supple. Definitely no tyre levers are needed to fit onto the wheel or take off. In the first 2,000 km there was remarkably little wear on the tyre, and very few significant cuts. Cuts seem more prevalent on my Continental tyres. I haven’t picked up any puncture in my first 3,000 km – 4,000 km (I’m never exactly sure how many km a tyre has done, but this is best guess. Usually costing £30-£32, these are pretty good value or a race ready tyre. They make a good summer riding tyre – whether your racing, training or doing a cyclo-sportive. They feel fast and are lightweight. It is £30 well spent. I think they look pretty good on my road bike too. Not sure about the pink sidewalls on the latest models, but I assume there are different choices. Continental Grand Prix 4000 are very close to the Ultremo in terms of specifications. But, the Continental 4000 are just a little more expensive and more prone to cuts. If I was buying again, I’d probably choose the Ultremo over the more popular Grand Prix 4000. One definite advantage of the Ultremo is that they are very easy to put on, and therefore less prone to pinch flats. They are also slightly lower weight than the Grand Prix 4000. So overall make a good choice. However, in past few years, the Grand Prix 4000 seem to have also improved in quality, with much less sidewall splitting. But, I’m not sure why I usually end up buying Grand Prix rather than the Ultremo (often availability in a shop). SnakeSkin. ‘The addition of “snakeskin” protects the tyre shoulder and side wall against sharp rocks and broken glass. Although side wall defects are quite rare in road racing, it is still annoying when it happens. 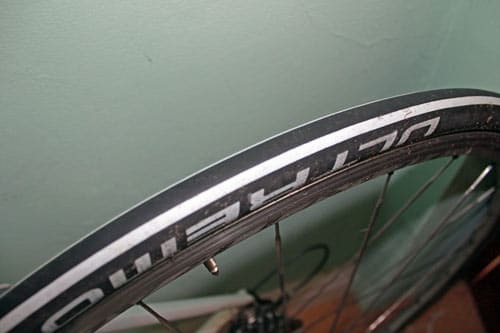 And worse, the tyre is often not just punctured by a cut, it is frequently completely destroyed. Double defense is the best prevention against this happening. A recent upgrade to the Schwalbe ZX is the addition of V-Guard – . The manufacturer claims it is ‘an extremely cut-resistant high-tech fibre (which) makes it possible to ensure even on very light tyres an extraordinary high level of puncture resistance.’ They also come with striking fluorescent side-walls. List price, £39.99. currently on sale at £20.99 – £22.99.